Curb appeal is the exterior appeal of a property as viewed from the street. Oftentimes, appraisers consider that initial look as a significant factor in determining a property’s value. One of the main elements that contribute to curb appeal is the driveway. Although a concrete driveway is not the most appealing type, there is a way to make it a lot more visually stimulating. Decorative concrete is one of the best things to ever happen in the remodeling industry. It makes use of existing concrete slabs and enhances its form and function through resurfacing or refinishing processes. Coatings and overlays can now be used to transform plain and boring concrete driveways into masterful works of art. What Makes Decorative Concrete Driveways Better? Resurfacing or refinishing a concrete driveway is less expensive than installing a new one. It requires fewer materials, manpower, and time. It is important to note, though, that there are several factors that could affect the cost, such as the size of the job, the coating used, and more. No matter what look you are trying to go for, you’re sure to find something. Decorative concrete is known for its wide selection of patterns, colors, and textures that driveway owners could mix and match. Although only a coating or overlay is added to the concrete, the result is a tough and durable surface that will surely last a long time if properly installed. Concrete stamped driveways are highly popular because of its ability to replicate traditional driveway materials like natural stone, brick, cobblestone, and more. The texture created after the stamping process helps improve traction and boost curb appeal. The spray knockdown texture uses a spray-down method to create a slip-resistant texture that is subtle but still absolutely stunning. 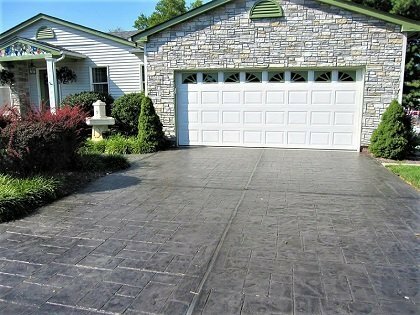 This troweled concrete finish is a good option if you want a driveway that stays cool to the touch even after sitting under the sun for hours. If the concrete driveway is in good shape and just needs a fresh layer of color, then stained concrete is highly recommended. If you want special effects and varying color tones similar to that of stone, an acid stain is a good choice. If you want more consistent colors all throughout or as part of a custom design, then water-based stains should be used. Create a Curb Appeal that Will Make Heads Turn. Call (720) 545-1766 for More about Concrete Driveways. Denver Concrete Artisans is a name you could trust when it comes to resurfacing and refinishing concrete driveways. We have over two decades of experience in handling concrete surfaces, repairing them, and making them a lot more appealing than they used to be. We make sure that our team only consists of the best in craftsmanship and with meticulous attention to detail. We also work on concrete patios, pool decks, interior floors, and more. We want to make sure that you are well-informed. That is why we are offering an initial consultation and cost estimate for free. Call us to request yours!